Color camera head with increased frame rates, high resolution acquisition and extremely accurate color reproduction. 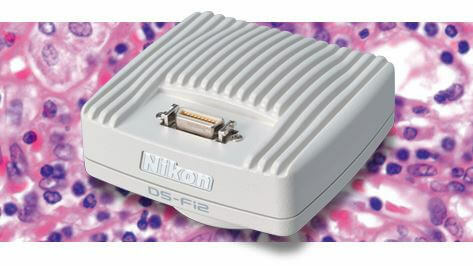 A microscope camera offering fast, high resolution image capture, with unsurpassed color representation. Nikon’s high-definition 5-megapixel CCD captures images at an impressive resolution of 2560 x 1920 pixels. Other advanced features include an enhanced frame rate of up to 21 fps and accurate color reproduction. 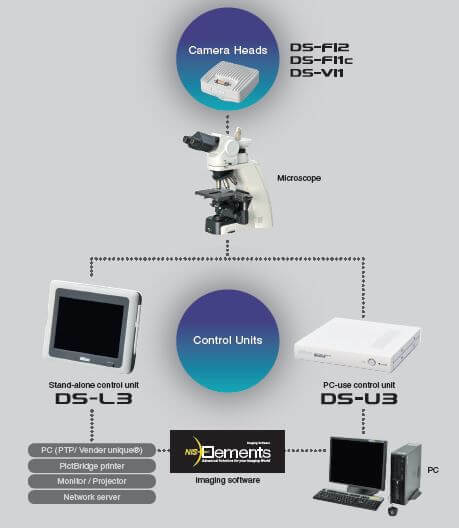 The DS-Fi2 high-definition color microscope camera head also has an expanded range of settings for exposure time, making it suitable for wide variety of applications and techniques, including brightfield, DIC, and phase contrast. Small pixel size and a field-of-view of 2,560 x 1,920 pixels allows you to acquire color images at very high resolution. Nikon’s industry-leading imaging technology achieves the best true color image possible, duplicating exactly what is seen by the microscope. With a frame rate of 21 frames per second, live images are displayed and updated smoothly, so focusing from a monitor is a simple task, greatly increasing the speed of inspection, measurement tasks, and acquisition. A high performance IR cut filter eliminates unwanted infrared contributions from halogen light sources, while maintaining excellent red color rendition for outstanding color reproduction. The DS-Fi2 is a high-quality, cost-effective camera for a wide variety of applications including brightfield, phase contrast, anddifferential interference contrast (DIC).